The new smart lights from Blue Sky Wireless brings your home into the future! The new Blue Sky Wireless LED Bluetooth® Smart Sync Bulb + Speaker converts your old, incandescent lights into smart lighting with a virtual surround sound stage right in your own home! You can add virtual surround sound by connecting up to 12 bulbs in any space. The app works fine but is slow to respond when first starting. My guess is that Bluetooth registration takes a while. Even though there are no lights listed in the lights and groups tab, I can control the color and do a slow fade transition through all the colors. Very cool. My request is to allow the user to select to NOT play my phone sounds through the speaker. I just wanted this to do synchronized colors on my porch lights. But when you connect via Bluetooth, it forces all the sounds to the bulb. So when I have turned the color fade sequence (mode4) and I’m texting someone, it dings out on the porch. If this is an app setting, I haven’t found it yet. Needs some work but a good app. Can’t wait to see some enhancements and performance tweaks. I recently bought three music +color changing bulbs+BT Music. (Replaced 3 recessed front porch spotlights for the holidays seasons. I read many of the recent reviews and was skeptical as there are many having trouble getting the colors to change or dim. GREAT IDEA! But the reality of what you can control and program AT THIS TIME WITH THIS APP is extremely limited so far (June 2018). The positive: The actual physical bulb is pretty ingenious, which is why I’m surprised the control app isn’t very sophisticated. 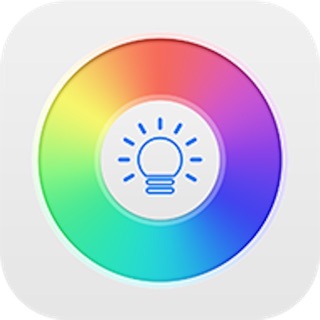 Also, tapping on the color wheel in the app DOES instantly get you that color in the bulb, which I find amazing. So, the downfalls or wishlist: For morning and evening alarms, I was hoping to pick the sounds or music, I mean it’s all right there! Why can’t this be done?! But the only options seem to be 6 very, very basic ringtones. For morning and evening lighting, attached to alarm I guess, I was hoping to select a sequence of lighting (color and intensity). Nothing complicated, maybe six. But no. Again, why not? The app so far is pretty limited or more nicely said, simplistic. And I’ve hit one or two bugs. Nothing big tho. So, if you’re content with picking an unusual color here and there, this works fine. Plus it’s only option I think to get the cool bulb to work. Haven’t tried the music lighting, yet, but there’s other reviews on that. © Blue Sky Wireless, LLC.